Well, Lukas' first birthday was a big hit! To start with, on his actual birthday, which was last Friday, everything went perfectly. That morning, Rita baked Lukas his very first birthday cake, and we decorated his room with balloons and streamers. He wasn't exactly sure what the occasion was, but he seemed to love all the excitement. Tobi was able to stay home for breakfast, which was really nice. After breakfast Lukas opened some of his presents from Tobi's parents and their friends. That afternoon, I finally got the phone and Internet installed at the new house, the contractor finished our picket fence (so that we didn't have to worry about kids (or dog running off at the party), and a company showed up to clean our windows (which are way to high and difficult for us to do on our own), so I was on cloud 9. I tried to create a presentation for his birthday party, using photos, videos, and some songs I had purchased off of Itunes, but in the end we settled for a photo slideshow, with the music playing separately (which was quite cute!)... a sort of "First Year in Review". Late that evening, after I put Lukas down, I began baking his cake for the following day. It wasn't very difficult, but I find it hard to bake when he's up and about. It was a simple chocolate cake, with chocolate chips and pudding in it, and chocolate frosting on top (which Tobi's father helped me with the following day). A laminated picture of him was in the center, and there were brightly colored chocolate coated candies in the corners. I also made some cupcakes for the kids, vanilla flavored with chocolate frosting on top. I got to bed around 1am, then woke up around 6:30 with a zillion things on my mind. We had to get ready, tidy up the house and decorate before people arrived at Noon. We draped brightly colored fabric in different areas of the house to make it circus-like (and Rita was so helpful!) Five hours went by so quickly, and the first guests showed up a half an hour early. We were pretty much ready, though, and the clown that we hired was early as well. He kept the kids busy with balloons, face painting, and a magic show, and in between we ate cake and opened presents. I had the slide show and music running in the background, and what the kids really enjoyed was when I had them put their hand and foot prints on a specially covered memory board (that I plan to hang in Lukas' room). It really couldn't have gone any better. Unfortunately, he seems to have caught the rotavirus bug (aka Gastroenteritis). Fortunately for him, I caught it as well, so I don't mind spending lots of time in bed with him at the moment. He has a fairly high fever, and I've been trying to get it down using baby Tylenol, but it's really persistant. And in addition to his gassiness, I think he must have some stomach cramps (I know I do). Poor little guy. And of course he has the signature diarreah that you get with Gastroenteritis. Yesterday we went to the mall with Oma and Opa. We didn't buy much, but were happy to spend a bit more time with them before they go (tomorrow). Today we just hung around the house, spending most of our time in bed. But Lukas did do something really cute today. He has a little turtle that makes music when you press his belly, so Lukas kept pressing his belly, and when the music would start, he would dance along with it (while sitting). Very cute. And this morning he said "birdy". It was then that I remembered that he's said "birdy" a couple times. I'm going to say that the first time was 3 weeks ago (at the beginning of January). Sometimes I feel like a bad mother for not remembering the EXACT day that he said certain things, but they develop so quickly, it's hard to keep up! Not only that, but if I were to spend more time recording these moments, I wouldn't have as much time to cherish them. And so the part of his baby book where it says "First Words" and "Date", shall remain blank. Oh well. I think the little guy's waking up now, so I better run! Oh dear, have I fallen off the band wagon. I was so determined to exercise, eat healthy, write regularly, etc, etc. And then life happened. Well, it was actually the dreadful process of moving that got in the way. I know, I know... I said “no more excuses”... but moving is difficult enough as it is, and when you add a baby to the equation, and there’s no professional moving company involved, it becomes significantly more difficult. Oh, and the in-laws have arrived. We’re so happy to have them here, and having people come to stay with us motivated us to unpack everything within a couple days! Despite the stress of the move, I have been doing a bit of walking every day with the dog, and I am proud of myself for getting the new house in order... it looks great, and it’s pretty comfy. Lukas has his own pooh-bear themed room and (although he still sleeps in our room at night) during the day he sleeps in a big-boy bed (he already knows how to get out of bed... by getting on his belly and sliding his feet out). Saturday: Tobi’s parents arrived. 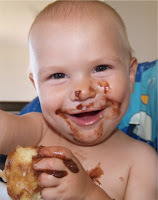 From the start, he really took to “Oma”, and enjoys Opa as well! (We fired up our indoor grill for the first time and ate ostrich for lunch. Yum! Went to dinner at “The Gannet”... I ate shark.) Lukas was a bit fussy at dinner. He seems to be really gassy lately. Poor little guy. Sunday: Rita asks Lukas, “Wo ist die Mama?” Und Lukas answers, “Da!” while pointing at me. CUTE! He ate liverwurst for the first time (from Papa, of course). Seemed to like it (yuck!) Later, we spent some time on the beach at “The Point”. There’s a nice little rock pool (or “tide pool”?) down there, where it’s safe for the children to swim, without waves crashing into them (or great whites wandering by). He really loved it. He really has no fear of water! I think he’s going to be a natural swimmer. Afterwards, we had a drink at Delfino’s Lukas was tired, but couldn’t go to sleep with all that action, so he was quite fussy. Monday: Stood on his own for a few seconds! Mama screamed, with excitement, and tried to get him to repeat it for Oma, but we had no such luck! He also started holding the phone up to his ear... imitating what he sees us doing. Tuesday: We tried a new “Kindermusik”. It was too slow-paced for Lukas, so the search continues. But it was cute to see him amongst so many children. While they all stayed safely by their Mommies, Lukas immediately ventured out on hands and knees to look at everyone from the center of the circle. In the afternoon, we went on a long walk with Rita and Felix. Lukas fell asleep. Wednesday: Lukas slept until 8 AM (an hour later than usual)! At breakfast, he began trying to feed himself with a spoon. It’s amazing how much coordination that requires! Later, he refused to take naps (other than a very short one in the morning). Despite his sleepy state, he was pretty good for most of the day. Rita and Walter entertained him for a while, to give Mommy some “me” time. Some of Papa’s colleagues came over for dinner... we had beef and ostrich on the indoor grill. Lukas has begun “throwing” Felix’s toys for him (imitating Mama & Papa). Felix looks kind of bewildered when his toy lands a foot from Lukas, and requires some coaxing to pick it up afterwards (he must be thinking, “Is that seriously the furthest you can throw?”) When Felix grabs it, and Lukas has the other side, Lukas sternly says “Out!” (to which Felix never listens). It’s quite fun to watch them play. They’re going to be great friends in a few years. Well, now that I've gotten you up-to-date, it's time for us to get ready for our "Top Toddlers" class in George. I'm going to drop Tobi's parents off at the mall beforehand, then meet them afterwards for lunch. I just know it's going to be a great year. Ok, so Lukas started off the year with his first (and hopefully only) bout of tonsillitis, but I just finished a fantastic book, and I'm ready to take on the world! The book is called The Best Year of Your Life, by Debbie Ford... and it's so energizing and motivating (once you get past the first couple chapters). 1) To buy a house in Germany, where our family can live, love, and thrive, and that we can go "home" to regularly, to get recharged and nourished, and where friends and family can come, to join us for meals, and feel the warmth in our hearts (Debbie Ford wrote some of this for me... she had a similar goal... too easy!). 2) To maximize the rest of my time in South Africa by more actively and frequently visiting key points of interest - allowing me to leave South Africa with feelings of satisfaction, rather than regret, and feeling "ready" to move on to the next chapter in our lives. Achieving this goal will also help me to develop a better understanding of South Africa, and will in turn, provide me with a more balanced perspective of the world. Secondly, I want to change the format of these blogs a bit. I'm going to write about "our" adventures at the top, and then Lukas' development at the bottom. That way I can be sure that I'm not forgetting to write about our little boy, as he grows into a little man. In addition to these goals and proposed changes, I'm also working towards a more general goal... practicing behaviors that I want my children to emmulate. This includes leading healthier relationships, thinking before I speak, making smarter financial decisions and better food choices, and exercising regularly. No more excuses... they only serve as self-sabotage! I don't own a scale, but I don't feel that I need one. I feel better with each day... stronger, leaner, and healthier. (I'm eating lots of eggs, veggies, and lean meat, and I occasionally allow myself some dark bread loaded with seeds, some youghurt with musli, or if I'm really craving carbs, a bit of nutella). And I exercise every day. One morning I'll jog, and the next day it's a 30 minute walk with the dog and baby (in our neighborhood... which has lots of steep inclines)! Well, enough about that. Let me tell you about our New Year's Eve here in Mossel Bay. We were thinking about spending it in Cape Town, but the idea of spending 8 hours in the car with the baby (4 hours each way), made it slightly less attractive. And we could have gotten a babysitter and gone out, but we probably would have spent the evening thinking about Lukas, and wondering how the sitter was doing. As a parent, you swear that you can't wait for some free time, but when you have it, all you do is think of your children. Things just aren't as fun anymore without them. And so we spent New Year's in Mossel Bay, but it was so nice! We went to our friends' house for a barbeque and drinks. They're parents too, and have two great danes (so we were even able to bring Felix along!). They also have a house overlooking the bay, so we were able to watch the fireworks from the dinner table, amongst great company, as the kids slept peacefully in the bedroom. It was the perfect New Year's Eve. When Lukas woke up around 3 AM, we packed him up in the car and headed home. The next day we drove to George to take the dog for a swim at the water reservoir there. It's a fairly quiet area, and the mountains serve as the backdrop, which makes it quite spectacular. And Felix was well overdue for some water action. He had a great time, and so did we, until the fishing boat came. When they showed up, Felix went nuts. He wanted to take off after that strange floating device that carries the people. And Tobi had a heck of a time restraining him. 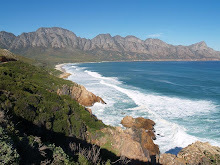 So we ate our picnic lunch quickly, let Felix swim a little more, and then headed back Mossel Bay. The following day was Tuesday, January 2nd... and that evening we went to our very first concert here! Ronan Keating performed at the Casino, in a big field near the golf course. And so we bought tickets, although we only knew a couple of his songs. For $40 per person, we were close enough to catch his sweat droplets... but not until after the three other local groups performed. Our neighbors were there as well, so we stood next to them during the concert, understanding every tenth word of their Afrikaans conversations with friends. And of course I thought of Lukas the whole time. We were gone for about 6 hours, and all I could think of is how much I would like to be home, lying next to my son, reading a book... I think I've officially become an old lady! It's events like that which make you appreciate the "boring", normal daily routine which you call life. How grand it is! Last night we finally found some time to go to a cute little café in the small town of Klein Braak, or Little Brack (a River). The café is called Valljape (I think I spelled that right), and my friend Deoni has been recommending it for months. It's a tiny restaurant in an old train depot, in the back of a quaint little town. I found the food pretty good (I ordered a squash soup and the stuffed chicken as my main course), but Tobi wasn't thrilled with his Biltong (beef jerky) soup, or the lamb that he ordered as his main course. The service was ok (there's really only one server), but Lukas was tired, and that always spells disaster. Tobi and I took turns walking around with him... which made it hard for us to really enjoy our dinner. Oh well. But he got a real kick out of the two little bunnies that were hopping along next to the restaurant! Well, let's move on to the section on Lukas. He's getting into more trouble every day... and fighting sleep more with each nap. As I write, he's standing on his tip-toes, trying to reach some matches that are sitting on a table here in the living room. He's getting angry that he can't quite get to them. How frustrating! But along with that mischievous side, comes a smile that's to die for. He loves to smile, because he loves the reaction that he gets... a smile in return. It's a stop-what-you're-doing-and-play-with-me-smile, and it works! Complete strangers stop whatever they're doing to smile right back at him, and to tell us how cute he is. He's really a fun little boy, and I can't believe how much he's learned over the past couple months. Within two months, he's learned how to crawl, pull himself up, imitate sounds, hold things between his thumb and forefinger (and put them in his mouth... of course), climb up stairs, climb down stairs, get down off of the bed, and so much more! It's really incredible! Well, I better wrap this up. We've invited some friends over for dinner, and I have to start tidying up! I realize this entry was a lot to digest. I'll try to write more frequently, so the entries aren't quite so long. And I love to get comments, so feel free to post a comment if you have the time! P.S. We wish you the "Best Year of Your Life", too! Make it happen!